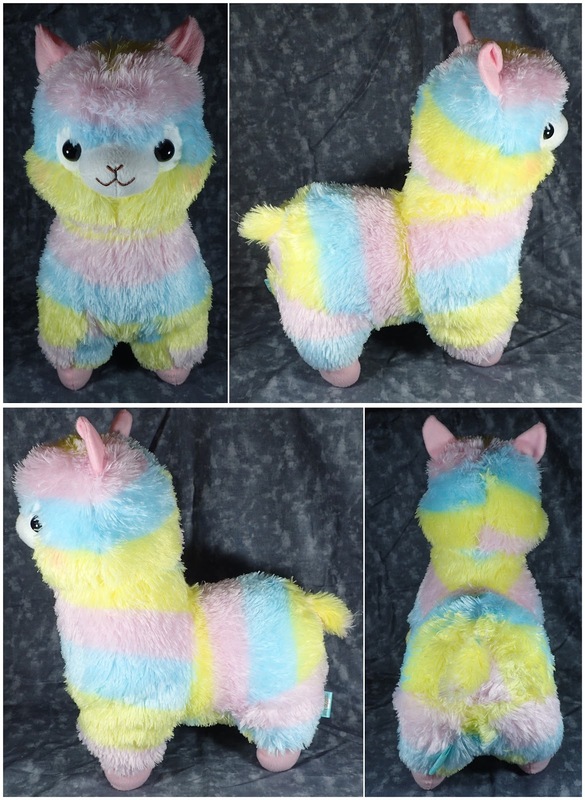 I recently received another Alpaca - the adorable Rainbow Alpacasso. Although she is a "big" Amuse plush she is smaller than my other "big" Alpaca but I believe that is because they have reduced their "big" size from 60cm to 40cm so the new Rainbow series is around 40cm tall. But the size is good as I do have a number of large plush toys and am running out of room! Same quality as all Amuse plush toys. Very cute but to those wanting the iconic Rainbow Alpacasso know that now you can only get version two brand new and she is smaller and doesn't come with the Rainbow Alpacasso tag - her tag is now generic and matches all the recently released Rainbow Amuse plush toys. But if you are worried about fakes make sure you buy from a trusted retailer such as Tokyo Otaku Mode or AmiAmi.